The office building landscape continues to change rapidly. Building owners and landlords are quickly having to change and adapt their existing portfolio of real estate to align with a multi-generational workforce and its related expectations. More and more employees expect their employers’ building to feature more amenities and look inviting to tenants and their guests. If you are a building owner, that may sound expensive, so what do you do? We were recently tasked with updating a 3,600 sq. lobby of a 16-story building built in Kansas City, Missouri in 1987. The owner sought to refresh the lobby space and elevate the initial experience of all those entering the building, all while minimizing construction and disruption to the space. Our team introduced materials that could clad over the existing dated granite, therefore eliminating the need to demolish walls. Those new materials were gyp board and a large format tile that coordinated with existing brass finishes within the building, to help reduce costs. Both materials introduce a lighter color scheme that makes the space seem bigger and much brighter. The large format wall tile was placed in areas that needed to withstand day to day wear-and-tear, such as around the entrance/exit doors and the elevator lobby, and it was applied directly to existing granite, so no demolition was required. That saved budget dollars and time. The existing flooring was also replaced with porcelain tile and carpet. The chosen floor tile was offered at a good price point and offered enough variation in texture and pattern to keep the space interesting. The tile colors and pattern break up the space; the flooring features honed tiles placed at random that allow the light to reflect with a slight twinkle. The new carpet in the lobby centers the seating area and decreases the acoustics of the space. Coordinating walk-off carpet was added at exterior entrances to reduce the amount of dirt entering the newly remodeled area. Much of the new flooring was installed during the overnight hours so that the lobby could remain open during the entire construction process. The owner also selected new furniture to add purpose to the space and provide an additional waiting area for the building. The pieces feature integrated charging receptacles for patrons use. With the remodel project complete, the 30-year old building now features a lobby which is inviting, clean and modern and remains competitive with the many new office environment options around the city. To see additional photos, check out the project page. 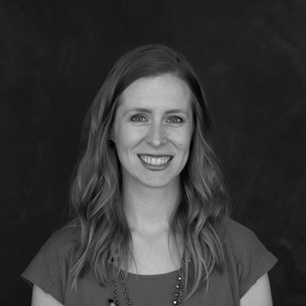 Alison works with a retail, office and grocery clients to cohesively merge their brand with the built environment through clear standards and quality execution of her work. As a Project Manager, she is actively involved in all project phases, and leads coordination with our clients, project design teams, engineering consultants, contractors and other third-party vendors. Email her.